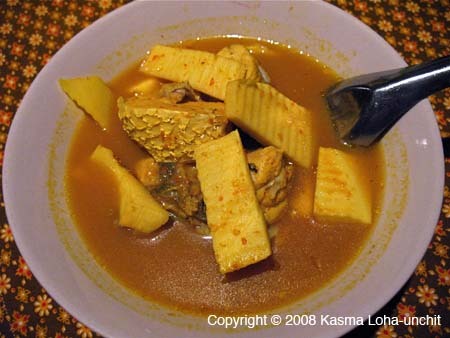 Southern Sour Curry: Southern Sour Curry with Fish and Coconut Shoots (Gkaeng Som Bplah Gkapong Yawd Maprao Awn). Kasma's version if this dish is called Southern-Style Hot Sour Curry with Halibut/Prawns and Coconut Shoots or Green Papaya (Gkaeng Leuang/Som Gkoong Gkap Yawd Maprao/Malagaw) and is taught in Advanced Series Set G (class 4). It is aroi magk (Thai for exteremly delicious).